Exclusive to our shop. Design area is approx. 10” X 20”. 13 count. Finishes to approx 9 ½” x 9 ½” with a 2” gusset. Price is for canvas only. Design by Trubey Designs, “Unique Boutique”. Exclusive to our shop. Design area is approx. 10" X 20" on 13 count. Finishes to approx. 9 1/2" X 9 1/2" with a 2" gusset. Price includes canvas and wool. Design by Trubey Designs, "Unique Boutique". 13 ct canvas from JP Needlepoint Designs; finished size is approximately 7 ¾” X 8 ½”, excluding bead trim. Price excludes finishing but includes canvas, threads, ribbon trim for top and bead trim for bottom. Threads include Burmilana Wool, Medicis Wool, Soie D'Alger, Balger metallic braid and Ribbon Floss. Finished models are shown for other canvases in the collection. 13 ct canvas from JP Needlepoint Designs; finished size is approximately 7 ¾” X 8 ½”, excluding bead trim. Price excludes finishing but includes canvas, threads, ribbon trim for top and bead trim for bottom. Threads include Silk & Ivory, Balger metallic braid and Ribbon Floss. Finished models are shown for other canvases in the collection. 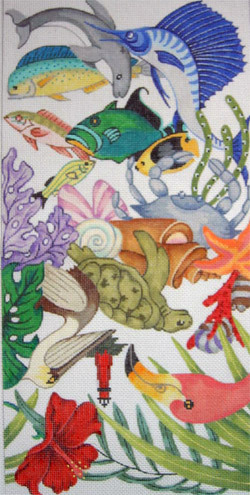 13 ct canvas from JP Needlepoint Designs; finished size is approximately 7 ¾” X 8 ½”, excluding bead trim. Price excludes finishing but includes canvas, threads, ribbon trim for top and bead trim for bottom. Threads include Silk & Ivory, Splendor and Soie D'Alger. Finished models are shown for other canvases in the collection. 13 ct canvas from JP Needlepoint Designs; finished size is approximately 7 ¾” X 8 ½”, excluding bead trim. Price excludes finishing but includes canvas, threads, ribbon trim for top and bead trim for bottom. Threads include Silk & Ivory, Soie D'Alger and Splendor. Finished models are shown for other canvases in the collection. Purse - Jungle Visages et derriers KIT! Exclusive to our shop. Design area is approx. 10" X 20", 13 count. Finishes to approx. 9 1/2" X 9 1/2" with a 2" gusset. Price includes canvas and wool. Design by Trubey Designs, "Unique Boutique". 13 ct canvas from JP Needlepoint Designs; finished size is approximately 7 ¾” X 8 ½”, excluding bead trim. Price excludes finishing but includes canvas, threads, ribbon trim for top and bead trim for bottom. Threads include Impressions, Silk & Ivory and Splendor. Finished models are shown for other canvases in the collection. 13 ct canvas from JP Needlepoint Designs; finished size is approximately 7 ¾” X 8 ½”, excluding bead trim. Price excludes finishing but includes canvas, threads, ribbon trim for top and bead trim for bottom. Threads include Silk & Ivory and Splendor. Finished models are shown for other canvases in the collection. 13 ct canvas from JP Needlepoint Designs; finished size is approximately 7 ¾” X 8 ½”, excluding bead trim. Price excludes finishing but includes canvas, threads, ribbon trim for top and bead trim for bottom. Threads include Silk & Ivory, Impressions, Splendor, Soie D'Alger and Frye Works Metallic Ribbon. Finished models are shown for other canvases in the collection. Exclusive to our shop from the diva of purse designs, Trubey Walker. Design area is about 10" x 20", on #13 mesh. It finishes to about 9-1/2" x 9-1/2" with a self-gusset. Hobo-shaped purse featuring familiar Italian ceramic design on muted blue background. Ground would be handsome stitched in Silk 'n Ivory, perhaps #36 - Admiral Blue - with pearl coton shades of gold, soft yellow and cream design. Blue or red moire lining with blue leather backing and shoulder strap. #13 canvas. Also available on banker's grey ground with shades of taupe and pearlized grey design. Very sophisticated. Black or grey leather finishing with coordinated moire lining. See caption for Italian Mosaic Purse. 18 ct or 13 ct. St. Louis landmarks by Lisa. Background is left unpainted so you can pick your color, use a solid or "tweed" two colors. Purses are shown finished but price is for canvas only. "Unique Boutique"
18 count (shown finished - price is for canvases only). Show your Spirit of St. Louis with this original satchel purse displaying prominent St. Louis Landmarks and sports teams. Design by Lisa. "Unique Boutique"
Travel Satchel (shown finished - price for canvas only). Finished size approximately 71/2" tall, 11 1/2 " long and 8" wide. 13 count, 3 pieces of canvas (2 cathedral style ends and 1 main body of purse). Stitch painted, design by Trubey. "Unique Boutique"